Although the S&P 500 Index had already turned higher last Monday, thanks to comments from Federal Reserve Chairman Powell on Wednesday, the chances for the development of a Double Bottom have been greatly increased despite uncertainty about the meeting between Trump and Xi Jinping on Saturday. As of Friday some options indictors expressed concern. Details follow in the market review below including a partial Commitment of Traders update for WTI crude oil. S&P 500 Index (SPX) S&P 500 Index (SPX) 2759.99 rebounded 127.43 points or +4.84% last week decreasing the probability of testing the October 29 low at 2603.54 anytime soon while increasing the probability that a Double Bottom pattern will activate on a close above 2816.94. 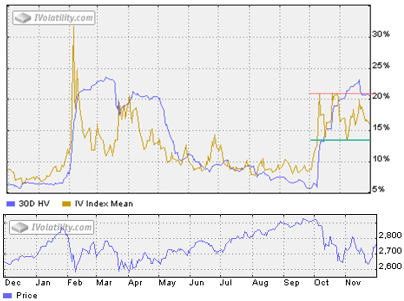 CBOE Volatility Index® (VIX) 18.07 declined 3.45 points or -16.03% last week. Our similar IVolatility Implied Volatility Index Mean, IVXM using four at-the-money options for each expiration period along with our proprietary technique that includes the delta and vega of each option, declined 2.85 points or -15.08% last week ending at 16.05. The one year volatility and SPX line charts follow. The current range marked with green and red horizontal lines in the volatility chart above for the IVXM between 12.75 and about 22, make good decison points with a close above 22 as a sell or hedge signal, while a close back below the green line at 12.75 suggests the advance will likley continue. With 12 trading days until December expiration, the day-weighted premium between December and January allocated 60% to December and 40% to January for a -1.04% premium vs. -4.93% last week ending November 23. Still in the caution area, well below the bottom of the green zone between 10% to 20%. New Probability Calculator for Stock and Option Traders! 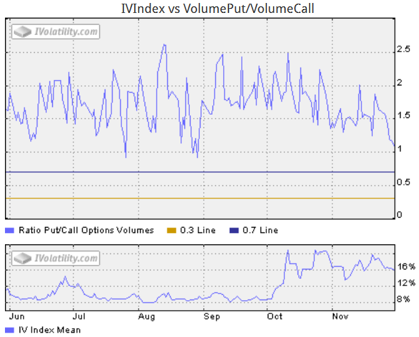 This S&P 500 Index put/call ratio chart now 1.08 shows declining put option activity before the important Trump/Xi Jinping meeting suggesting less hedging activity usually associated with lower levels of implied volatility when the market is trending higher. 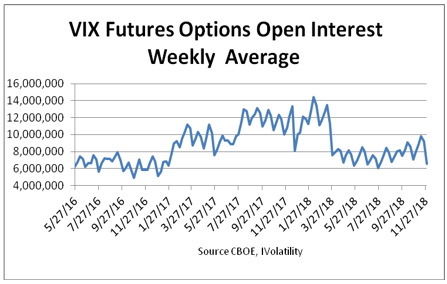 Next this chart shows options open interest on VIX futures declined last week from 9.2 million contracts on November 23 to 6.60 million contracts, reflecting less enthusiasm for hedging with options on VIX futures. This suggest no surprises were expected from the Trump/Xi Jinping meeting. WTI Crude Oil (CL) 50.93 basis January up .52 or +1.01% for the week. While it could be in the process of making another small consolidation before heading lower again further downside could be limited until after the December 6 OPEC meeting when oversupply and production cuts are on the agenda. 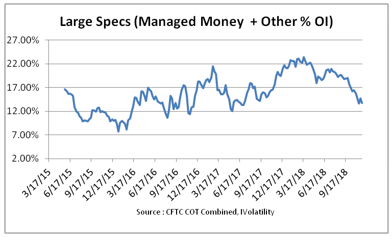 The Disaggregated Commitments of Traders - Options and Futures Combined report (COT) by the CFTC as of November 27 shows "Managed Money,” the group that best correlates with crude oil price changes and arguably the most important, covered more shorts than they decreased their longs. Here is the chart for the short position. 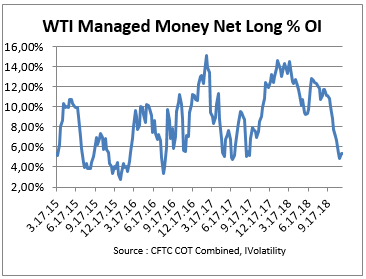 Currently their net long position as a percentage of the open interest is back to the low level where it was in June last year. Combining "Managed Money" with Other Reportables "Others" creates the category called "Large Speculators." Now 13.75% of the open interest vs. 14.66 % last week ending November 23 and the lowest since July 3, 2017 at 13.32% when WTI cash was 47.08 and 12.01% on May 16, 2017 when WTI cash was 48.64. Adding to the short covering premise "Swap Dealers" covered 17,854 short contacts while increasing their longs 1,418 contacts. 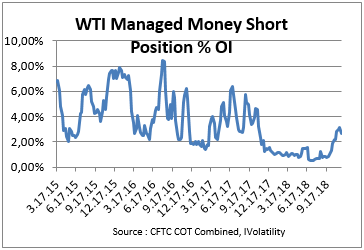 Last week's short covering activity suggests the seasonal bottom could be close, especially considering the upcoming December 6, OPEC meeting along with comments from the Saudis and Russians that could set off more short covering. Contrary to last week's comment, the chances for a Double Bottom greatly improved last week. For the S&P 500 Index, a close back above 2816.94 is needed to activate the pattern. If so, the minimum objective would be determined by measuring from the October 17 high to the October 29 low (2816.94 -2603.54) = 213.40, added to 2816.94 or 3030.34, well above the September 21 high of 2,940.91. Comments about postponing increased tariffs while working out details for trade deal with China is the first step. Then more dovish comments from Federal Reserve Chairman Powell after the December FOMC meeting would add momentum. 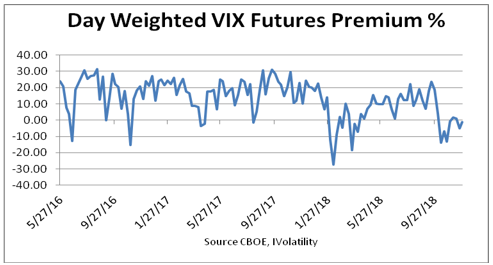 Although implied volatility did not rise much before the Trump/Xi Jinping meeting it will likely decline Monday adding more support for equities. However, since there were few signs of increased hedging Friday a gap up open seems less likely. S&P 500 Index advances following comments by Federal Reserve Chairman Powell last Wednesday increased the odds for a Double Bottom and year-end rally assuming negotiations with China begin, along with more dovish comments from the Federal Reserve. In addition, a seasonal bottom for crude oil that would support oil and gas equities could be near. Next week will include updates for both the potential S&P Double Bottom and WTI crude oil.